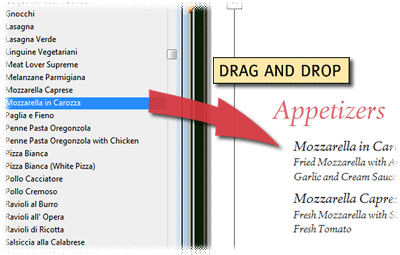 Make you own custom menus - with MenuPro - or the new online version iMenuPro. Change or update them, anytime for free. No waiting for graphic artists, no relying on services, no monthly or annual fees. Whether you need daily specials or a dining room menu, iMenuPro Menu Software gives you quick, professional menu designs without the expense or hassle of using a graphic artist or a desktop-publisher program. Easier than Word-processing or templates, iMenuPro was designed specifically for creating menus. It contains powerful features that are unavailable with any other software. It lets you design or make changes to your menus with a single-click - giving you the designer look without the hard work. After entering your food and drink items into a list, you use your computer's mouse to drag individual items over to a picture of your menu on the screen. The menu entries are formatted and spaced automatically by the program. On the screen you can quickly move from one of the pre-designed styles to another style so you can compare and choose the design that looks best. Logos, borders, and other artwork can then be added to complete your menu. When printed on quality paper using a high-quality printer, your menus will be indistinguishable from print-shop menus. 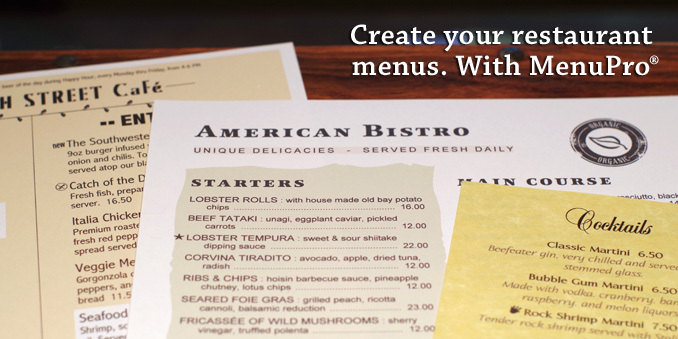 The fastest, most affordable way to create Menus in-house! 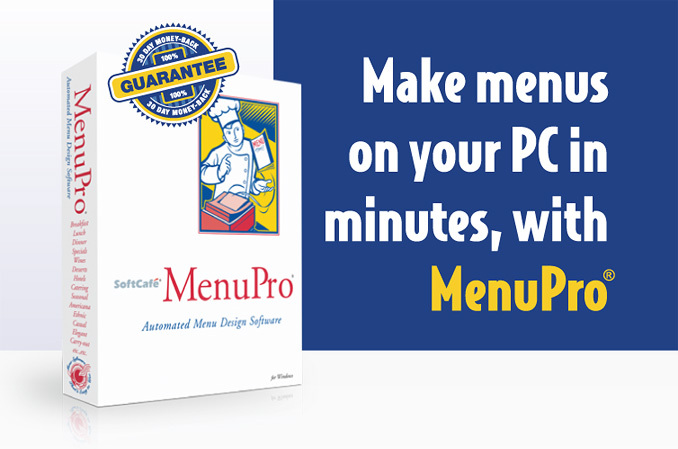 MenuPro comes complete - no other software is required - it does not require or use a word processor or templates. Menu designs, fonts, clip art, illustrations, watermarks, backgrounds, and borders are all included and installed automatically, allowing you to start making your own menus in a matter of minutes. And it's backed by our unconditional 30-DAY, money-back guarantee. SoftCafe manufactures menu design, menu printing, menu styles, restaurant menu maker, menu creator, restaurant menu programs, menu template, and menu designer software. Our ready-to-print menu designs, styles, ideas, menu borders, menu backgrounds, and food and menu clipart provide the most easy-to-use program for daily menus and specials, restaurant menus, cafe menus, catering menus, chef-tasting menus, hotel menus, take-out menu, menu flyers and more. Restaurant owners, design pros, and culinary students alike will find everything they need to create and design professional menus. Our Menu Design Software has created award winning menus and is a quick and easy to use solution for dynamic menu content, allowing you to both print menus in-house and post them online. SoftCafe is dedicated to bringing you the highest quality menu creator software and food clipart available - our software is superior to free ware and our competitive pricing will save you money on menu printing and will pay for itself the first time you use it.